new semi-detached chalet, quiet and comfortable. With 2 bedrooms and 2 bathrooms. Semi-detached chalet with terrace, 2 bedrooms and 2 bathrooms, very functional. The cottage is new, comfortable and very functional with its entrance hall and two bathrooms. It is adjoining the owners, you have a private parking. The area is quiet and residential, near the forest, it is a starting point for walks. The terrace is furnished with views of the Aiguille du Midi, Glacier des Bossons and red needles. The WiFi connection is free. The nearest shops are about 3km. The guest card provided on arrival gives you free access to public transport. The chalet has all the basics for a great stay! We had a fabulous family Christmas here and would definitely return! Such a nice change to being stuck in a hotel room! Everything is very close by and the hosts are great to deal with. The whole property was spotless when we arrived and is situated in a really quiet area with fantastic views of the mountains straight out the back of the property. The kitchen and shower rooms where more than we hoped for and were very clean and pretty new by the look of it. They had all the appliances we would need and more which was great. Claude our host was great too. Very friendly and full of knowledge and information about transport and the mountains if you require it. All in all it was perfect for us with plenty of space inside and out and close proximity to the town via a bus or train with the free public transport passes that are given to you by Claude on arrival. Thanks to Claude for a great stay and we will hopefully be returning sometime in the future. A lovely chalet with a great host! Having a car makes life a lot easier but that also brings its own problems after heavy snowfall (which the skiers want). The only problem we experienced was getting to the chalet and had to fit snow blankets to the car tyres on a number of occasions as the road is not cleared. We loved our stay at Claude's property. He was a great host and the space was perfect, with amazing views! We would stay there again. 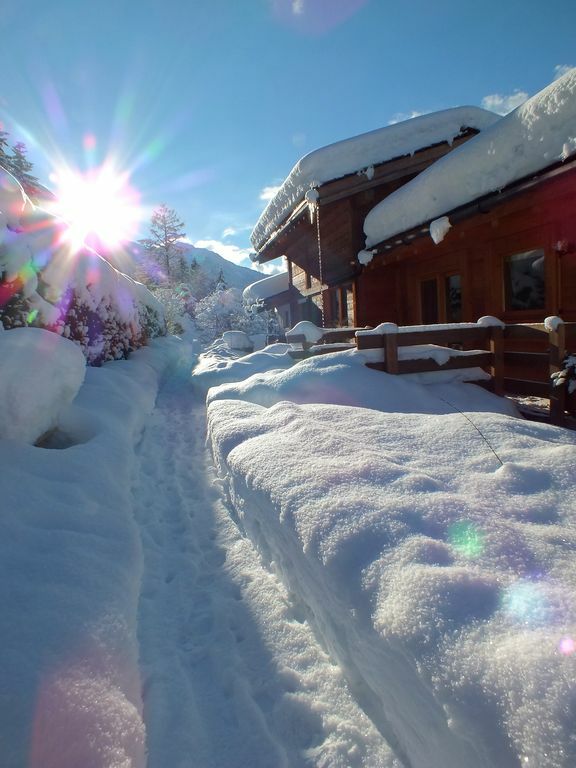 This chalet as well as the owners went above and beyond our expectations! Claude and his wife were so kind and even met us when we arrived late to help us get settled in. The chalet was very clean and everything was updated. The views from the chalet were amazing! We were in the center of Chamonix within minutes in the car. We would definitely recommend this wonderful home and we look forward to coming back again in the future! Lovely, recently built chalet in a quiet residential street not far from Chamonix and Les Houches. The cozy living room features an impressive view of the glacier Bosson. While it is possible to get there by public transport, having a car is an advantage. Just don't forget the winter tires and chains, both were needed while we were there. The house is modern, very well insulated and warm. The owner lives next doors and works as a skiing instructor. As we came for backcountry ski-touring and the avalanche risk was high, he was very helpful with figuring out alternative plans for the days we stayed there, with a daily update of his assessment of the current situation. There were no basic ingredients (e.g. salt, pepper, oil) in the otherwise well equipped kitchen (dishwasher included), but the owner was kind enough to help out with filling in what was missing on our late arrival on the first evening. You also need to bring your own soap. All in all: highly recommended! Arrival in the Chamonix Valley, the White Highway, exit 30 Les Bossons towards Les Songenaz. Close to Italy and Switzerland, Chamonix, world capital of skiing and mountaineering, offers many other leisure ... We will be happy to assist you, offer you practical advice and good addresses! Caution de 400€ demandée à l'arrivée (chèque ou espèces / restitué le jour du départ). Linge en option : Draps 15€ / lit - Serviettes de toilette 8€ / personne Remise des clés par le propriétaire présent sur place. Pendant les vacances scolaires françaises, les séjours sont de 6 nuitées minimum.